Stonewall Kitchen Roasted Apple Grille Sauce - made from roasted apples & pure maple syrup. Roasting the apples brings out the sweetest flavor naturally...Roasted Apple Grille Sauce is delicious when used to baste short ribs or pork loin. Add roasted apple grill sauce to your favorite homemade baked bean recipe for a unique flavor. 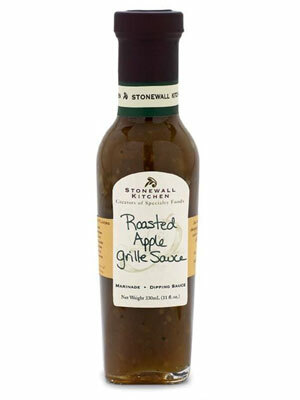 Stonewall Kitchen has won acclaim from national food critics for this award-winning Roasted Apple Grille Sauce. Simply enjoy! Stonewall Kitchen Roasted Apple Grille Sauce.